Congratulations to Cheam Fields Primary Academy who won the Sutton and Cheam tournament on Sunday (22nd April). 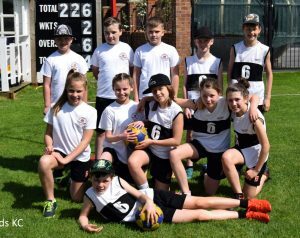 The result means that Cheam Fields have qualified to represent the London Borough of Sutton at the National Schools Championships Finals which will take place during England Korfball’s Grand Finals at the Copper Box Arena in London on Saturday 12th May. Our thanks to everyone at Nomads Korfball Club who provided many of the referees and coaches for the tournament. And also to the parents and teachers for their support. It was fantastic to see so many children having fun and playing Korfball. We’re looking forward to seeing Cheam Fields in action at the iconic Copper Box Arena – Can they go on to win the overall championships?